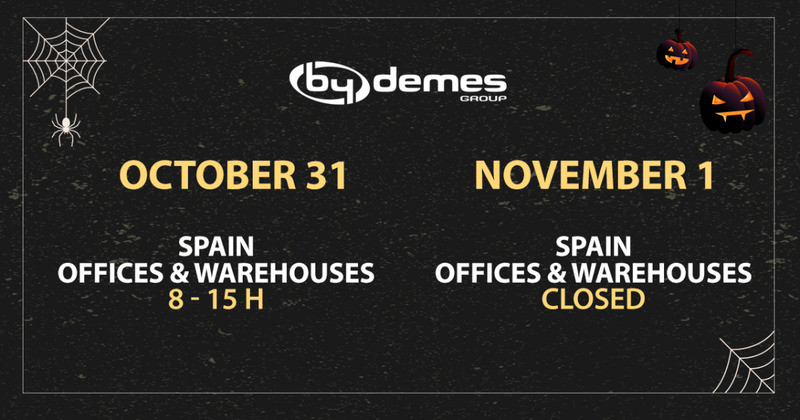 We would like to inform you that on Wednesday, October 31 all the offices and warehouses from Spain (Barcelona, Madrid and Canary Islands) will be open from 8 a.m. to 3 p.m. (Spanish time) uninterruptedly because of the eve of All Saints' Day. And the same offices will be closed on Thursday, November 1. We will serve you as usual on Friday, November 2. Our Ireland office will remain at your disposal with the usual schedule from 9 am to 5:30 pm to continue offering the best service.